When preparing meals in large kitchens and catering establishments, large quantities of hot fat and oil are in use. Even when handled with the utmost care, they pose a considerable fire risk. 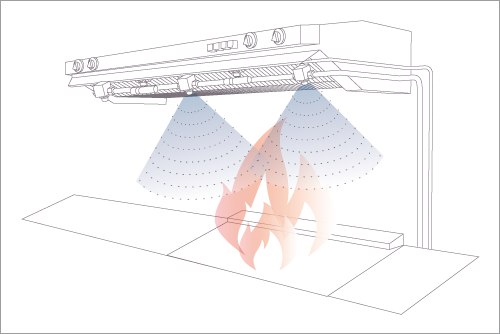 An unnoticed failure in the overheating protection can easily cause a major fire. protecfire offers a competitively priced and effective solution for this. In case of fire, the pneumatic trigger elements are automatically activated by the increasing temperature. The trigger temperature is set at 93°C. The triggering of the system causes a rise in pressure in the pilotline which serves as a signal for the extinguishing process. Our fire-fighting system is based on the principle of a finespray extinguishing system which atomizes the extinguishing agent as a fine mist with the aid of our own specially developed nozzles. In the extinguishing process, the surface of solids and cooking oil is thoroughly wetted and impregnated. A protective film is formed on flammable, liquid fat, blanketing fire areas with a sustainable gas-proof layer.